10 times Parineeti Chopra gave us major bridesmaid outfit goals! Parineeti Chopra has always been slaying all fashion goals with her offbeat style and her bubbly looks! Her love for indo-westerns and totally hattke attires are giving our bridesmaids some serious #outfitgoals. 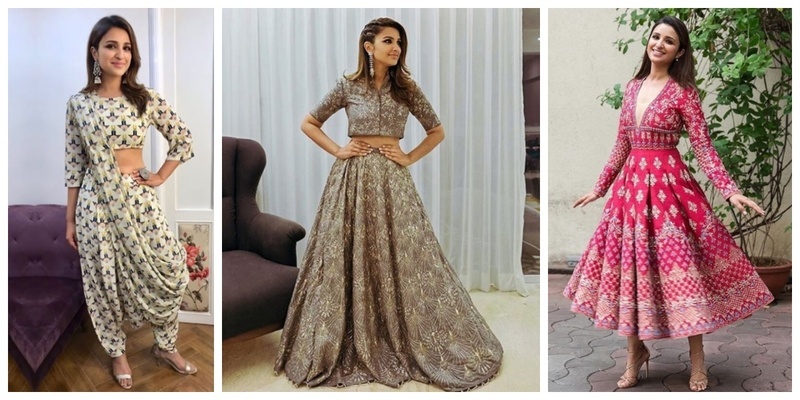 This blog is dedicated to Parineeti’s hot and happening style and how everytime she manages to provide our bride’s BFFs with perfect options to rock the wedding. 1. The coordinated grey lehenga for the 21st century bridesmaid! 2. Ivory and blush affair gown perfect for an elegant wedding! 3. All pink gown for the bubbly bridesmaids! 4. Anarkali that reflects royalty! 5. Surplice neckline plain kurti that is simple yet impactful! This gorgeous off-white mini dress with a translucent cape is the perfect dress to make an offbeat entry to your BFF’s engagement or cocktail bash! 7. Funky Indo-western dhoti outfit is perfect for your bestie’s Mehndi! 8. When you’re happy and you know it- twirl around! 9. For the desi girl in you, the perfect teal saree with a heavily embellished blouse! 10. The golden Diva gown! 11. Dolled up gown with pearl details! P.S.- That golden and pearl nath is totally drool worthy! 13. A glamorous shimmer gown for the princess in you! 14. Shades of three- Indo western outfit for a fun and pepply night! 15. Glammed up grey gown for a fairytale wedding! 16. Pastel hues mirror work lehenga with a minimal look! 17. Want a patakha look? This indo-western outfit is the perfect way to go! 18. Subtle aqua blue sharara for that simple and sophisticated look! 19. Royal blue cape lehenga that has a beauty beyond words!